"Canadian performing arts have more revenue than all of our sports put together. This boggles most people's minds. All you have to do is open up the daily newspaper and see how many pages are devoted to sports, and how many to performing arts. Yet there are more jobs in Canadian cultural industries than in agriculture, mining, and forestry combined. Despite this, we're still not doing a good job of protecting Canada's cultural industry. Would you live next door to the world's most powerful culture-exporting country in the world, and then agree to sell-off major components of your cultural industry? Eighty-nine per cent of Canadians say the CBC helps distinguish Canada from the United States, but we decide to cut the CBC's budget by $400 million. This is no way to maintain the Canadian identity." In 2004, 3 companies controlled 63.3% of all daily newspapers in Canada. Of the 102 daily newspapers in Canada, only 6 remain truly independent. Canada ranks 33rd among the world's peacekeeping nations. 21% of all jobs in Canada are low-paying jobs. For 25 years middle class are not going anywhere in terms of income. Public opinion polls consistently show that the majority of Canadians put social programs at or near the top of their list of priorities, far ahead of tax cuts, debt repayments or defence spending. Of the 30 OECD countries, we rank 21st in citizen taxes, while we're 27th in corporate taxes. Aboriginal people constitute about three per cent of the Canadian population, but they make up about 20 per cent of all prison inmates. Canada, for public spending on education as a percentage of all government spending, ranks 91st of the world's countries. In 2005, over $22.3 billion of foreign-controlled corporate profits left Canada. public flow of information - "...Professor Marc Raboy specializes in media policy at McGill University. In his opinion, “The horse left the barn a long time ago, but we keep seeing more extreme cases of media consolidation.” It’s never too late, but what needs to be done quickly will require strong political leadership that seems to be non-existent in our country today. Meanwhile, the Stephen Harper government, in unprecedented ways, has to the best of its ability cut off the flow of information to the media, and hence to the public. Most ministers are not allowed to talk freely to the media. The public flow of information and requests under the Access to Information Act have been slowed in a manner never seen before. And worse, much of the news media people seem increasingly intimidated by the all-powerful Prime Minister’s Office and are prepared to accept that they must be on a pre-approved list before they are even allowed to ask questions..." (June 2008: The Press Vs. The People). takeovers - "In this respect, it’s interesting to note that, in compiling its figures, Statistics Canada does not consider companies such as Air Canada, the CNR, Petro-Canada, or Canada’s largest oil and gas producer Encana in its foreign ownership calculations, even though all four and dozens of other important “Canadian” corporations are already majority-foreign-owned, mostly by Americans. Many other countries consider that as little as 10% foreign ownership can and often will represent effective foreign control...There’s no room here to do proper justice to all the other foreign ownership negatives, but much can be summed up in my favorite quote on the subject of takeovers, which comes from none other than Brian Mulroney: “I’ve yet to see a takeover that has created a single job, except of course for lawyers and accountants.” Try looking at the number of jobs per million dollars in sales and compare Canadian firms and U.S. subsidiaries. The numbers are shocking and most revealing. In 2000, foreign firms in Canada made 53% of all manufacturing shipments in this country, but employed under 32% of manufacturing workers. The second question is much more difficult and truly borders on the bizarre. After the takeover of the Hudson’s Bay Company, the marvellous Fairmont Hotel icons and Dofasco, The Economist put it this way: “In many other countries, the sale of national heirlooms would spark fierce opposition. Not in Canada.” (April 2006: Selling Off Our Country). ownership and control - "Since Canada began, we Canadians have firmly resisted the idea that, just because the U.S. is so much bigger and more powerful, we must simply follow the American line. Only the most naïve of the most naïve fail to understand that increasing American ownership and control and increasing economic, military and other integration will inevitably lead to increasing across-the-board policy harmonization. And, to repeat, it won’t be the Americans harmonizing to Canadian policies and standards. The progressive erosion of Canadian sovereignty will be almost impossible to reverse. The ability of Canadians to act in their own best interests will diminish daily. The vitally important and valued differences between Canada and the United States will disappear. Yet, incredibly, our sellouts, our Americanizers, our anti-Canadians, our powerful, wealthy plutocracy say that our quality of life is overrated, that our social spending has “tax disadvantages,” and we should accelerate the integration of our country into the U.S. It’s “inevitable” and the need is “urgent”--even if Canadians “don’t want to accept it..." (February 2004: The Vanishing Country (Part III of III)). 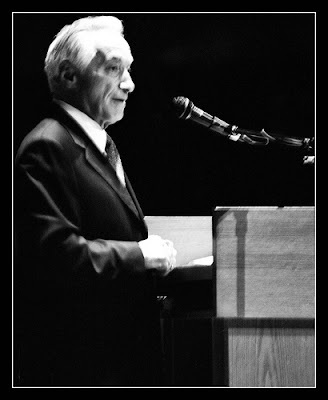 Mel Hurtig, OC (born June 24, 1932) is a Canadian publisher, author, political activist and former political candidate. He was born and raised in Edmonton, Alberta. He is the former president of the Edmonton Art Gallery. After supporting Pierre Trudeau's bid for Liberal leadership, he ran as a Liberal in the federal riding of Edmonton West, in 1972 but finished close second to longtime incumbent Marcel Lambert. In 1973, he broke with the party and joined with other Canadian Nationalist such as Walter Gordon, Jack McClelland, and Claude Ryan to establish the Committee for an Independent Canada. He served as Chair for the first year. This organization lobbied against foreign investment and cultural imperialism. In 1985, he established Council of Canadians, another nationalist organization, five years after the demise of the CIC. The primary purpose of this organization was to lobby against the rising tide of support for free trade. He would leave in 1992, but the council survives to this day. In 1992, Hurtig was elected leader of the National Party of Canada and led it in the 1993 federal election. He ran in the riding of Edmonton Northwest, but lost to Anne McLellan, finishing a distant third, but still with 4507 votes and 12.8% of the popular vote, by far the best showing of the National Party candidates (Wikepedia).